Graffiti eggplants are small and teardrop in shape, ranging from 7-15 centimeters in length, depending on the variety. The outer skin is shiny, thin, and smooth and is striped with violet with ivory white. The inner flesh is cream to pale white and has small, edible seeds. 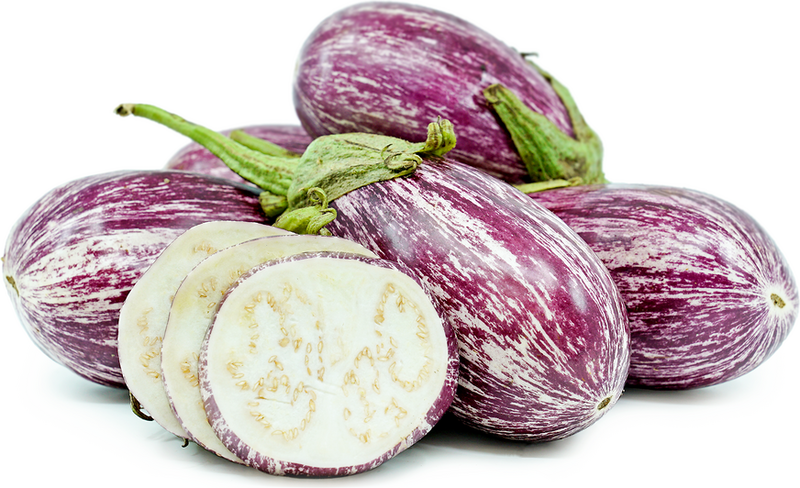 Graffiti eggplants are tender and smooth with a sweet and slightly fruity flavor when cooked. 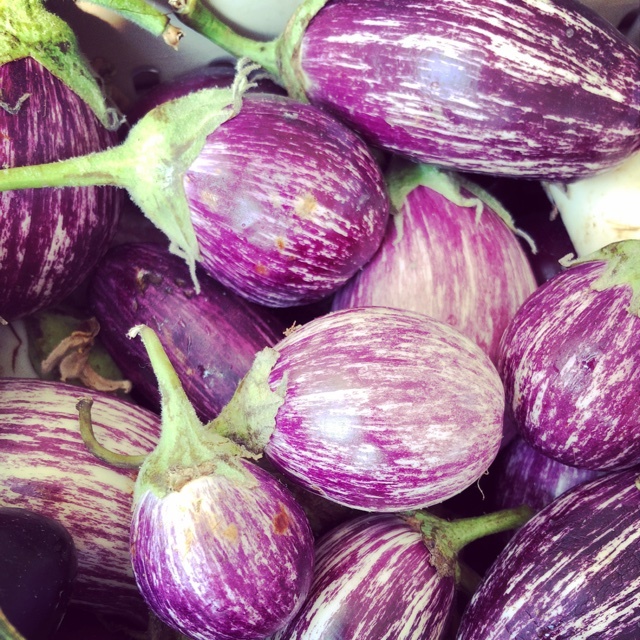 Graffiti eggplants are available during the summer through early fall. Graffiti eggplants, botanically classified as Solanum melongena, is a name given to some different varieties of eggplants that are a part of the Solanaceae, or nightshade family along with tomatoes, potatoes, and peppers. 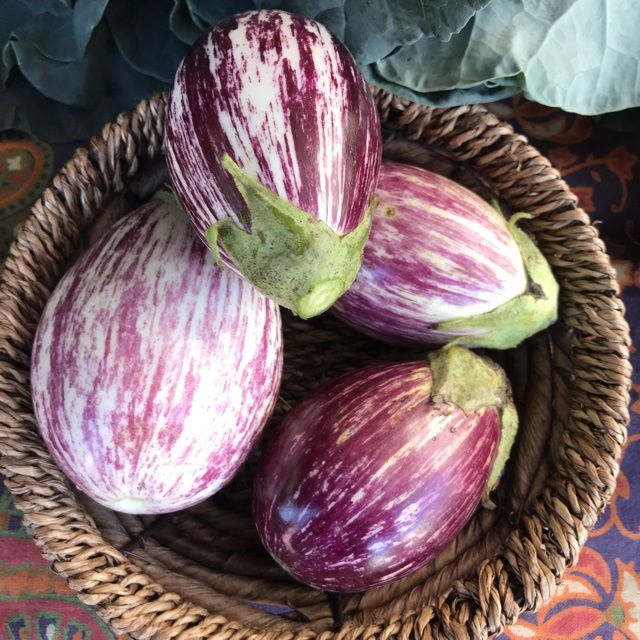 Also known as Pandora Striped Rose, Purple Rain, Listada De Gandia, Shooting Stars, and the Fairytale eggplant, Graffiti eggplants are known for its unique shape, sweet flavor, and striped coloring. Graffiti eggplants contain some vitamin C, iron, and fiber. 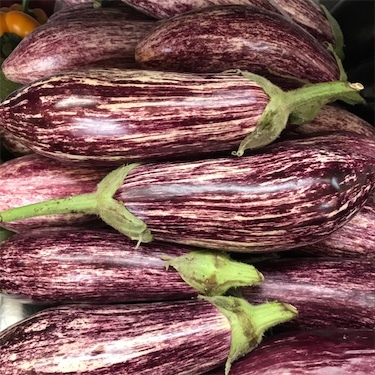 Graffiti eggplants are best suited for cooked applications such as sautéing, grilling, stewing, roasting, pan frying, and baking. They will cook quickly because of their small size, and the flesh is so thin and tender that it does not need to be removed. Graffiti eggplants can also be halved, hollowed slightly, stuffed, and baked with vegetables and grains. 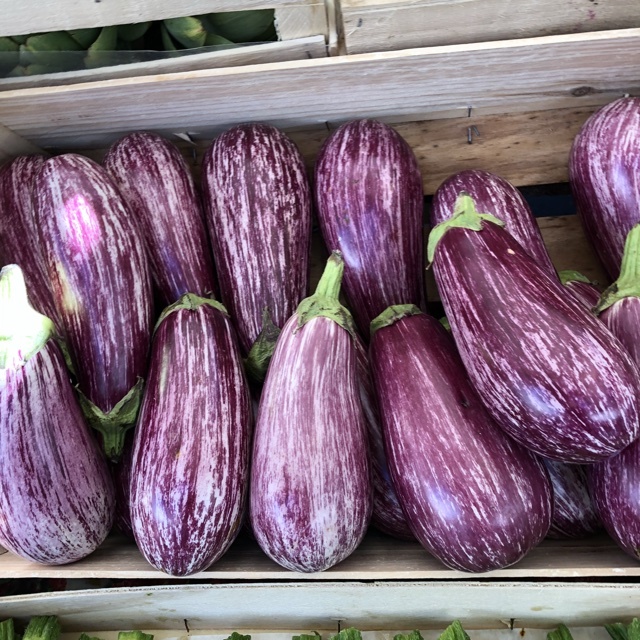 Graffiti eggplants pair well with tomato, squash, onions, red bell pepper, garlic, quinoa, chickpeas, coconut curry, heady spices such as cumin and zataar, rich grilled meats such as lamb, bright, fresh herbs, and young and melting cheeses such as chevre, feta, and mozzarella. Graffiti eggplants will keep up to three days when stored in a cool and dry place. 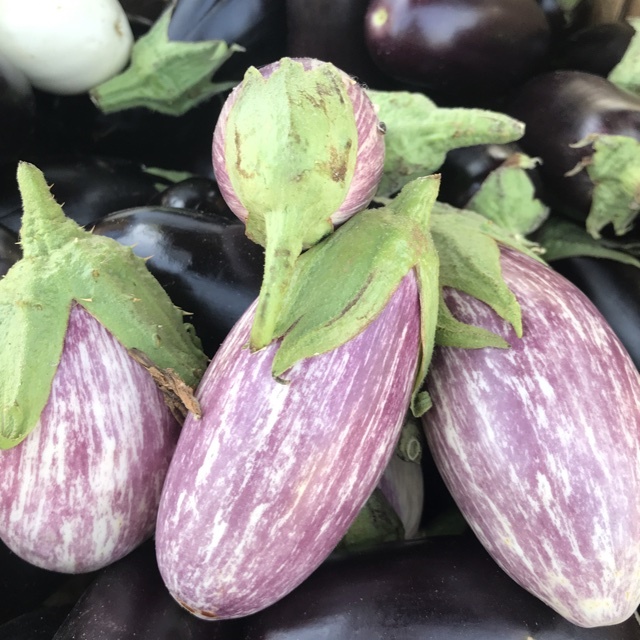 Many cultures in ancient times, especially in Italy, believed eggplants could cause insanity and a general un-wellness if consumed. This folklore stemmed from the eggplants relation to other toxic items in the nightshade family and because of their exceptionally bitter flavor. As this legend was slowly disproved over time, new eggplant varieties such as the Graffiti were specially bred for a sweeter and non-bitter taste. Graffiti eggplants are believed to be a part of the lineage related to the small teardrop multi-colored varieties of India. Trade routes would then transport earlier cultivars to Europe and the New World, where improved selections would be cultivated.  Today Graffiti eggplants can be found at farmers markets and specialty grocers in Europe, Asia, and the United States. Recipes that include Graffiti Eggplant. One is easiest, three is harder. People have shared Graffiti Eggplant using the Specialty Produce app for iPhone and Android. Sharer's comments : Graffiti Eggplant spotted at The Fresh Market. Sharer's comments : Graffiti Eggplant spotted at Hillcrest Farmers Market. 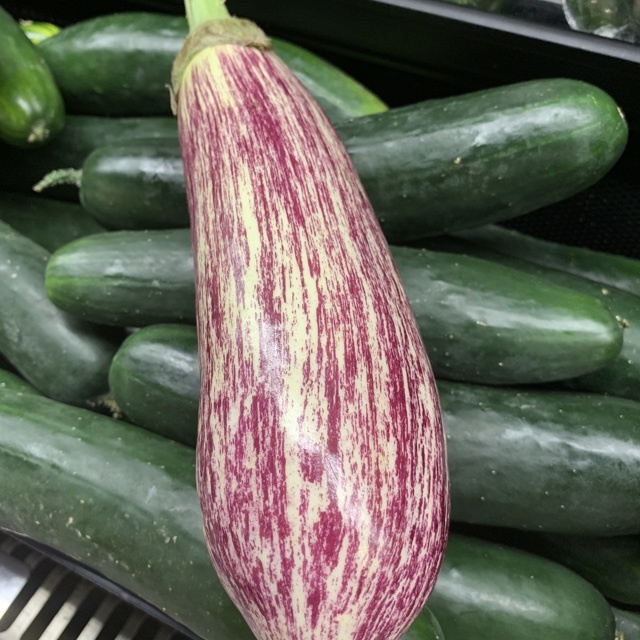 Sharer's comments : Graffiti Eggplant spotted at Central Market HEB Plano. Sharer's comments : Graffiti Eggplant spotted at Virginia Park Farmer's Market. 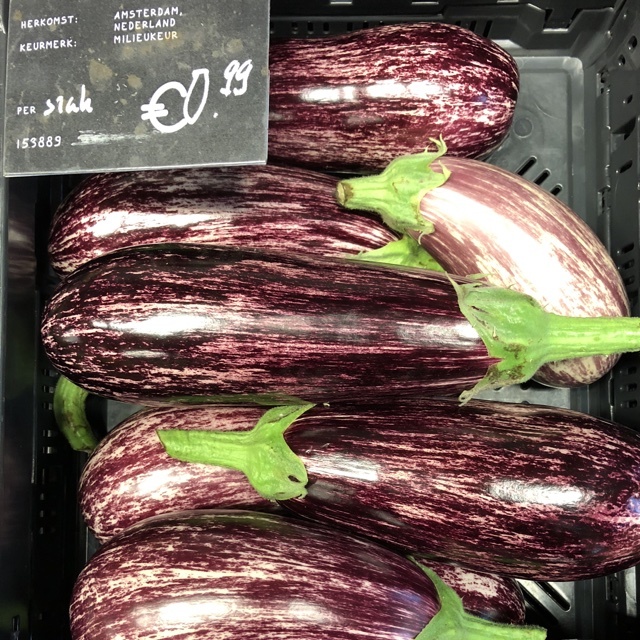 Sharer's comments : Graffiti Eggplant spotted at Bastille Market Paris . Sharer's comments : Graffiti Eggplant spotted at Mercer Island Farmers Market. Lovely! 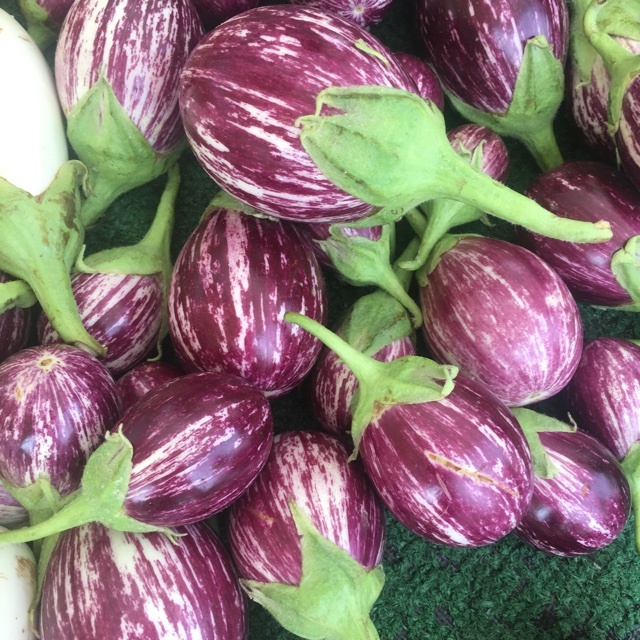 Sharer's comments : Graffiti Eggplant spotted at Vista Farmers Market. Sharer's comments : Graffiti Eggplant spotted at Little Italy Mercato. 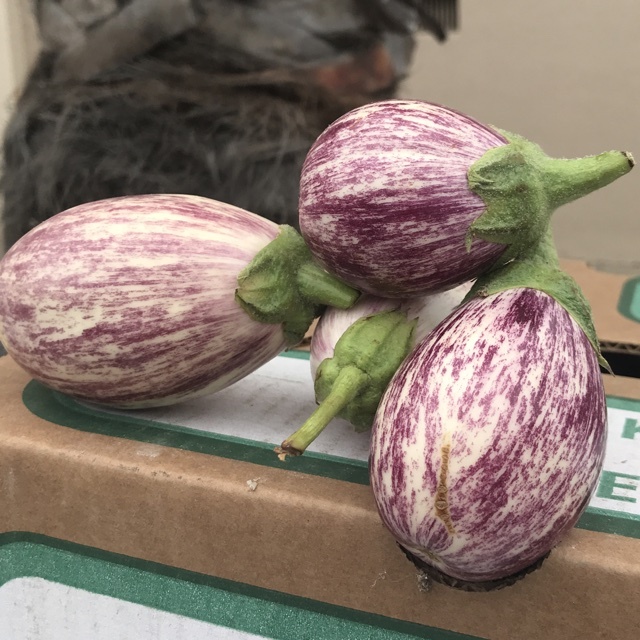 Sharer's comments : Though the vendor calls it "Fairy Eggplant".